» Health Blog » Uncategorized » Berberine: The Natural Antidote to Metabolic Derangement? Berberine, an orangish-yellow alkaloid found at high levels in the bark and root structures of many ground-covering shrubs, has an extensive history of use as a medicinal herb in North America, Europe, Asia, and India. Oregon grape, a North American source of berberine, was used by the native inhabitants and European colonists in the Pacific Northwest as a “blood toner,” an antimicrobial, and to ease digestive distress. [ Berberine has now become well known for its impact on metabolic function, and the issues associated with metabolic syndrome, conditions which were nary a thought for the natives and colonists who first inhabited the Northwest. Research on the topic of berberine as an anti-hyperglycemic agent began in the late 1980’s when its blood sugar-lowering effect was discovered while it was being used for the treatment of a diabetic patient with diarrhea. Since the early days of berberine research, multiple clinical trials have been performed investigating the use of berberine for a range of metabolic derangements. A 2015 meta-analysis of twenty-seven clinical trials concludes “berberine has comparable therapeutic effect on type 2 diabetes mellitus, hyperlipidemia and hypertension with no serious side effect,”[ substantiating the use of berberine for patients with metabolic syndrome. The systemic effects of berberine are in part mediated via the gut. Berberine promotes the growth of a bacteria known as Akkermansia muciniphila, which, interestingly enough, metformin has also been shown to increase. A muciniphila has been shown to positively impact weight gain, fat mass, and glucose metabolism. Higher levels of this normal flora exist in athletes and individuals with a low body mass index (BMI), and low levels have been observed in patients with impaired glucose metabolism and obesity.Animal studies have shown that administration of A. muciniphila not only reverses the metabolic effects of high-fat diet feeding, but also increases the intestinal levels of endocannabinoids, which play a role in controlling inflammation and the integrity of the gut barrier. Berberine affects the balance of the other bacteria in the gut as well, helping to reduce intestinal permeability and with this decreasing systemic levels of endotoxin, a contributor to inflammation, hepatocyte damage, and the development of atherosclerosis.Berberine has evidence of exerting a tonifying effect on gastrointestinal motility – increasing motility and contractility in states of hypofunction, and relaxing the system when it is in an excessively contractile state. Berberine has an antinociceptive effect, which may be in part due to its impact on contractility, or mediated via its interactions with the endogenous opioid system, or via nitric oxide synthesis.Berberine increases the gut production of short chain fatty acids (SCFAs), in particular butyrate,which has anti-inflammatory effects in the colon and beyond. Besides the impact that shifts in the gut microbial balance may have on metabolic health, there are many mechanisms by which berberine may affect glucose and lipid metabolism. Berberine activates adenosine monophosphate–activated protein kinase (AMPK), a fuel-sensing enzyme that is present in all mammalian cells.When activated, AMPK stimulates energy-generating processes within the cell such as glucose uptake and decreases energy consuming processes such as lipid synthesis, leading to a reduction in blood sugar levels and cholesterol production., Activation of AMPK by berberine also reduces inflammation, promotes vasodilation,[ and inhibits vasculature changes which contribute to stenosis. In addition to AMPK activation, the mechanisms via which berberine may positively impact blood sugar regulation are multifold. Berberine has been shown in cellular and/or animal studies to improve cellular sensitivity to insulin and glucose uptake, increase insulin secretion, inhibit gluconeogenesis,decrease gastrointestinal glucose absorption,[ and increase glycolysis. Several mechanisms via which berberine may improve cholesterol balance also have been described. 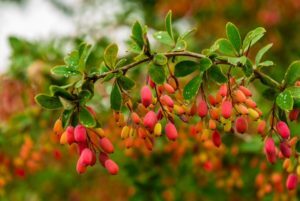 Berberine has been shown to inhibit cholesterol absorption, and increase its excretion.Berberine increases the expression of low-density lipoprotein (LDL) receptors in the liver, which promotes bile formation and secretion, and along with this, cholesterol. [ In the setting of hyperhomocysteinemia, common in cardiovascular disease and type 2 diabetes, berberine was also observed to inhibit HMG-CoA reductase activity and reduce hepatic cholesterol content. Increased cholesterol excretion also may occur due to berberine’s interaction with the bile acid farnesoid X receptor (FXR) in the intestinal epithelial cells. [ Interaction with FXR increases excretion of conjugated bile acids in the feces and reduces the accumulation of hepatic triglycerides and the development of HFD-associated obesity. The impact of berberine on glucose and cholesterol regulation has been the topic of multiple clinical studies. In one double-blind, placebo-controlled study, 116 patients with newly-diagnosed type 2 diabetes and dyslipidemia (without previous treatment) were randomized to receive either berberine at a dosage of 500 mg twice daily or placebo. [ After three months, significant decreases were seen in fasting blood glucose (FBG) from 126 ± 14 to 101 ± 16 mg/dL, postprandial blood glucose (PPG) from 216 ± 49 to 160 ± 50 mg/dL, hemoglobin A1c (HbA1c) from 7.5 ± 1.0 to 6.6 ± 0.7%, total cholesterol from 205 ± 38 to 168 ± 37 mg/dL, and LDL cholesterol from 125 ± 31 to 99 ± 30 mg/dL in individuals receiving berberine compared to placebo (P < 0.0001 for all). Triglycerides also were significantly reduced compared to placebo (P = 0.001) from 222 ± 181 to 143 ± 97 mg/dL. In another study consisting of newly-diagnosed type 2 diabetics, at a dosage of 500 mg three times daily berberine was found have effects identical to an equivalent dosage of metformin, significantly reducing HbA1c from 9.5 ± 0.5% to 7.5 ± 0.4%, FBG from 191 ± 16 mg/dL to 124 ± 9 mg/dL, and PPG from 357 ± 30.6 to 200 ± 16 mg/dL (P < 0.01 for all) after a period of three months. [ Triglycerides and total cholesterol also were significantly decreased (P < 0.05). With both metformin and berberine, the most dramatic changes in FBG and PPG were seen within the first two weeks, with minor improvements and approximately stable levels beyond this time. The second arm of this study involved the treatment of poorly-controlled type 2 diabetics (HbA1c of >7.0%). In these individuals, 500 mg of berberine three times daily was added to their current regime. In this population, the benefits of berberine were seen as soon as 7 days, with the FBG declining from 173 ± 49 to 141 ± 32 mg/dL (P < 0.001) by day 7, stabilizing at approximately 135 mg/dL for the remainder of the 3-month period. By 5 weeks, their HbA1c significantly decreased from 8.1% to 7.3% (P < 0.001), without significant change thereafter. The parameters of fasting insulin and homeostatic model assessment of insulin resistance (HOMA-IR) also showed improvement, decreasing by 29.0% (P < 0.01) and 46.7% (P < 0.001), respectively. Triglycerides, total cholesterol and LDL cholesterol also were significantly reduced. A 2013 meta-analysis of eleven randomized controlled trials on the topic of berberine and dyslipidemia well summarizes the additional clinical studies, finding significant reduction in total cholesterol, triglycerides, and LDL cholesterol, as well as a significant increase in high-density lipoprotein (HDL) cholesterol. [Improvements in triglycerides likely play into the reduction of hepatic fat content which has been seen in individuals with non-alcoholic fatty liver disease (NAFLD) as well. The research on berberine extends far beyond metabolic health, and extends to topics of cardiovascular disease, malignancy, dementia, osteoporosis, and mental illness as well. [ Clearly, this alkaloid has a high level of biological activity, and its use may combat the metabolic issues which many face.